Major Giroldi: With God and the gringos on our side, how can we fail? 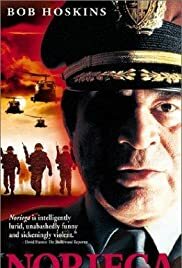 This story of Noriega is an interesting mix of tragedy and comedy. It tells the story of a human monster who evidently just wanted love. Hoskins is wonderfully adept at capturing the odd combination of evil and humor needed to make such a strange story work. The film also illustrates the way the US so often shoots itself in the foot by first supporting and then being betrayed by little tin gods -- and also betraying the people that we induce to fight the tin gods. Maybe we will learn the lesson someday, but not yet. Noriega seems to be, indeed, God's favorite because he gets away with so much and never seems to be terribly scathed. Maybe Noriega is an example of God's sense of humor. If so, he validates the old saying that God works in strange ways -- or, in this case, laughs in strange ways.